A new report says medical residents experience burnout and depression in Canada at a greater rate than other physicians. The Current hears from a Vancouver resident who says it's a lack of support in the system that contributes to symptoms. 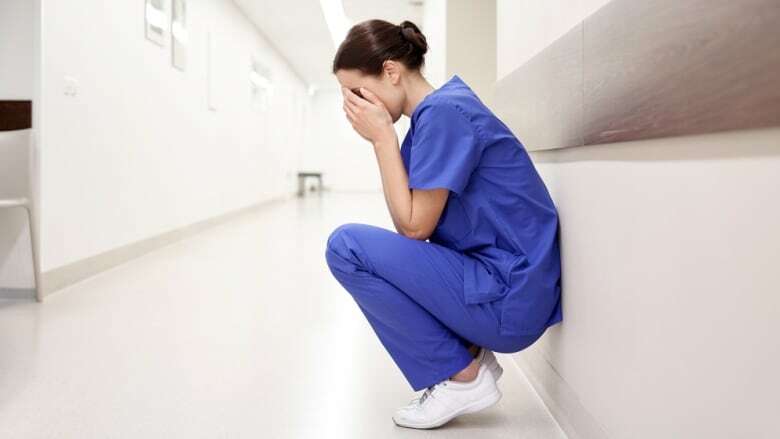 A significant number of medical residents in Canada are suffering burnout, depression and some are suicidal, according to a report that suggests many aren't accessing the help they need. "We have supervising physicians telling us: 'Don't call me unless someone's dying.' And that really was what was contributing to the fatigue, especially since it was in my first three months of residency and I was on a specialty rotation of internal medicine," a Vancouver medical resident told The Current's Anna Maria Tremonti. The Current has agreed to withhold the resident's name, citing her fear that speaking out on the issue will negatively affect her career. She says she's not surprised by the findings in the recent Canadian Medical Association survey that suggests medical residents, receiving their on-the-ground training before becoming full-fledged doctors, are 48 per cent more likely to report burnout, and 95 per cent more likely to screen positive for depression, than all other physicians. She pointed to many residents feeling isolated in the system and work culture. "Doctors are supposed to be very self-sufficient. So you essentially blame yourself and go 'I'm not working hard enough' or 'I am not doing enough,'" she explained. "So among my fellow residents, I see a lot of burnout and a lot of symptoms and signs of depression, and unfortunately sometimes not a lot of support even when we do reach out." But by the end of her first year, she found out she wasn't alone in how she felt. Three residents had taken stress leave in the same time period. This is the first time the CMA surveyed doctors across the country to get a better sense of mental health in the field. Doctors reported good overall mental health, but one in four said they experienced burnout. Only 15 per cent of physicians said they'd reached out for help in the last five years. These findings are worrisome for the CMA's president, Dr. Gigi Olser. "Any culture that has a sense of bravado, where that culture values self-sufficiency, and being stoic, not talking about your emotions, your feelings, not reaching out for help, will only drive burnout further underground, because people won't talk about it, and they won't reach out for help," he said. The Current's Vancouver resident guest echoed concerns about the stigma surrounding the issue. She said that since it takes many years and expenses — often paid with student loans — required to become a doctor, students and residents may not want to speak on a taboo topic, fearing it could sabotage their long-term career goals. "We want to know that our complaints are heard," she said. With files from The Canadian Press. Produced by Alison Masemann and Danielle Carr.